Our Legacy Scholar Diploma Frame. 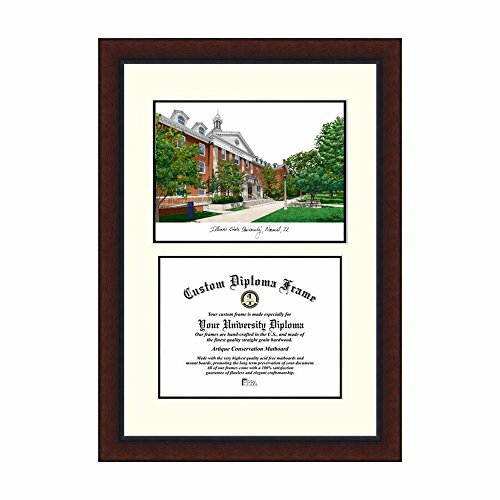 Diploma and Campus Image lithograph is for those searching for a modern look without the high gloss our Legacy frame with its dark, rich, satiny finish is destined to become a classic for all time. Can be custom made to fit any diploma or document size. Diploma sizes vary depending on a multitude of factors year of graduation, type of degree, undergraduate degree or post-graduate degree (law and medical degrees are often different sizes). FOR CUSTOMIZATION: PLEASE EMAIL US AND PROVIDE US WITH THE EXACT DIMENSIONS AND ORIENTATION OF YOUR DIPLOMA. Our Legacy frame with its dark, rich, satiny finish is destined to become a classic for all time. Can be custom made to fit any diploma or document size. Team Name: Illinois State Redbirds.